Oil leaks from the partially sank general cargo ship Bereket at Ahirkapi Anchorage off Istanbul. The vessel started getting water ingress from the engine room and submerged, resting the bottom and only wheelhouse was protruding from the water. The local authorities laid oil barriers and booms to restrict the spreading of the oil spot. Also the environment protection team sealed submerged vents to prevent oil from spilling below the water level. The oil spot was prevented from reaching the bottom, as fuel spreading on the water was removed with oil absorbing pads and barriers. The authorities are strictly monitoring the area around the troubled ship. There is no reported environmental pollution from the oil leak and the marine life was not affected. Two lanterns were installed on the ship’s wheelhouse for the safety of navigation and night visibility. Also the authorities released notice to mariners for the navigation danger at Ahirkapi Anchorage off Istanbul. Last week the general cargo ship Bereket sank in Marmara Sea at Ahirkapi Anchorage off Istanbul, Turkey. The vessel was unmanned and laid-up at the anchorage, when during the night started getting water ingress. 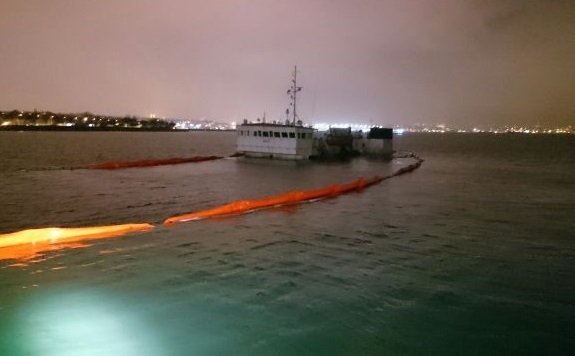 The authorities were unable to prevent sinking, but environment protection procedures were activated to stop the spreading of oil leak, as on board there were several tons of sludge and marine oil.